Have you ever been confidently moving through yoga class, smoothly stretching from one asana to the next when the teacher says, “Now we will move into the king of all poses; Headstand.” And your belly cringes and your brain screams “No!!! Anything but that! ” and you start looking around the room to see if there is some way you can sneak out so you won’t be the only whimp in the class not bravely turning upside down. I still have nightmares about that day when I was 7 years old and the gym teacher rolled out those stinky vilnyl gymnastic mats and told everyone it was time to learn gymnastics. Always considered a Tom Boy, Gym was my favorite class. But being quite tall and skinny for my age, gymnastics was not my forte. I was game for anything though, even standing on my head in that smelly gym with my face scrunched onto that even smellier gym mat. This was way back before all these concerns about injuries and insurance, so she just basically told us to put our hands down next to our head and kick up. So up I went and SNAP my neck bent and my shoulder went down hard and the rest of me followed in a mass of crumpled arms and legs. I am happy to say no permanent injury occurred, but ever since then I have been very wary of anything having to do with putting pressure on my neck. Maybe you have had a similar experience or maybe you are just a smart cautious person who realizes your neck is a precious resource to be kept healthy at all costs! So let’s just say 40 some years later when I was taking Yoga Teacher Training and the instructor asked for a volunteer to face one of the scariest poses, I gave it more than serious consideration. But I knew somewhere deep inside of me that this was a pose I needed to face head on. After full disclosure to my instructor of my past history with headstand, and my desperate fear of a neck injury, he helped me through Supported Headstand. Two of the bigger guys in my class volunteered to stand on either side just to make me feel even more secure. The Pose Itself Was Well Within My Physical Abilities. The Challenge Was To Convince My Mind That I Could Do It And To Overcome That Paralyzing (Let’S Not Use That Word!) Fear Of Injuring My Neck. 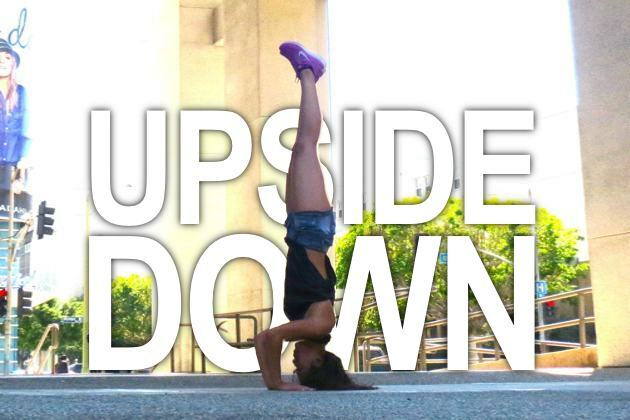 Headstand may not be your asana nemesis but it was mine. Yoga helped me to face my darkest physical fear and helped me realize I am stronger than I knew, both mentally and physically. Knowing that I can face my darkest fears with the help of good friends and yoga has helped me feel strong enough to take on all kinds of previously daunting challenges. You too can face your fears through your yoga practice. Give Tripod Balance a try and if you feel very brave move against the wall and pull up into a full Sirsasana! Conquer your fears! Use a folded blanket or sticky mat to pad your head and forearms. Kneel on the floor. Begin with your hands and knees on the mat. Lower the crown of your head to the floor so it's in front of your hands. You'll know your head is in the right position because your elbows will be directly over your wrists and you'll be able to see your hands. Your head and both palms will form the points of an equilateral triangle. Once your head and hands feel stable, straighten both legs and walk your feet towards your face as far as possible. Inhale and lift your knees off the floor. Carefully walk your feet closer to your elbows, heels elevated. Actively lift through the top thighs, forming an inverted "V." Firm the shoulder blades against your back and lift them toward the tailbone so the front torso stays as long as possible. This should help prevent the weight of the shoulders collapsing onto your neck and head. Exhale and lift your feet away from the floor. Shift your hips over your shoulders, and keep your hands planted firmly on the mat. Practice doing Tripod Balance, by resting your knees on your triceps. Hold this pose for five deep breaths. Then slowly lower your feet to the floor.